Bradi with the Bob Peterfish Sportsmanship Award! Bradi Banner has been involved in the Special Olympics Hamilton County for six years! She is a avid swimmer and participates in track and field. Bradi is legally blind and one of SOHC’s hardest working athletes! 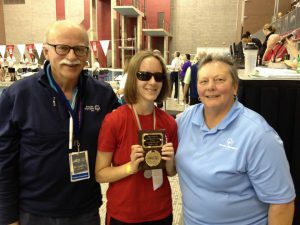 Not only did she win the Bob Peterfish Sportsmanship Award at the Special Olympics Ohio State Aquatics meet this past weekend she was also honored to sing the National Anthem at it’s opening ceremonies! When SOHC Program Director, Janet Smith, found out there was no one to sing the Anthem at the State Games she immediately thought of Bradi. Bradi sings the National Anthem at our local swim meets and games, but was very enthusiastic to get the call to sing at the State level. Thank you so much for asking me to sing the Star Spangled Banner. i would be sing the star spangled Banner at the home meet. not at The State games. This is not the first Sportsmanship award Bradi has been given through the Special Olympics. She also received the Ethel Luken Award earlier this year for outstanding achievement! Below is what Bradi’s coaches, who nominated her, for the award had to say about her and we definitely agree! can’t see them. She once assured coach Anne Knodle that she wasn’t old, she didn’t even have grey hair. do it, you do it” This athlete’s response was “I didn’t see anything” while laughing sweetly. Bopit is a modern version of Simon. So imagine playing two when you can’t see them. Her singing voice is truly beautiful. She regularly sings the national anthem at swim meets. Congrats Bradi on of your previous accomplishments with in and outside of the Special Olympics! We are sure there are more to come in your future! THANK YOU FOR BEING A CHAMPION BRADI!